The year is 1648 and life in Venice is serene for Isabella Hawkins and her friends Willem, Al-Qasim and Signora Contarini. Together they publish fine books like the controversial encyclopaedia, The Sum of All Knowledge. When a new Inquisitor declares war on free speech however, they are forced to flee across the seas to the wondrous capital of the Ottoman Empire, Constantinople, which is ruled by the infamous Sultanate of the Women. Old friends and new, including the boy Sultan and his sister, welcome them to the world’s greatest city. But Isabella is soon entangled in poisonous palace intrigues, while her friends secretly play perilous games of their own. The fascinating and page-turning sequel to Act of Faith, which was shortlisted for the 2012 NSW Premier’s Literary awards, the 2012 Gold Inky awards and highly commended in the 2012 Barbara Jefferies Awards. Do you like the idea of being transported to another time and place? 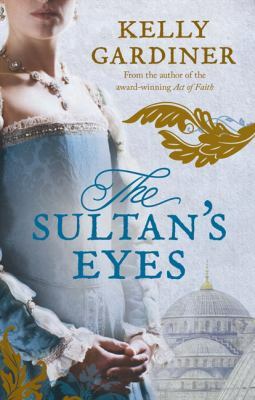 Then you will love reading ‘The Sultan’s Eyes’. This was a wonderful book, just as good if not better than ‘Act of Faith’, the first book in the series; although both books can be read as individual novels. The way the author Kelly Gardiner describes the time (1600’s) and the place the (Ottoman Empire) is very descriptive and instantly transports you to the era. Although marketed towards a Young Adult audience; this is a great book for anyone who loves to read Historical Fiction. Support another great Australian author and treat yourself to a great book, read ‘The Sultan’s Eyes’. This entry was posted in Australian Authors, Awards & Prize Lists, Fiction, Historical Fiction, Recommended Reading, Young Adult and tagged book review, Kelly Gardiner, Parramatta Library, The Sultan's eyes, YA fiction by admin. Bookmark the permalink.